Two out of 18 alexistrative districts of Tuva - Sut-Khol and Oviur - are going to celebrate their 60th anniversary in September this year with a week's interval. The sports competitions dedicated to the jubilee have already started in Oviur. Valery Kuular has become the winner of the festive chess tournament and got 1,500 roubles' premium. On the 1st of September teams, representing all the 6 Oviur sumons (villages), are going to compete for the Great Football Cup. A week later an International volley-ball match between Oviur sportsmen and mongolian players from the frontier Ybsa-Nur aimak will take place in Khandagaity, the Oviur district's centre. But the main festivities including wrestling and the horse-races will be held on 13-15. The work of the Ministry for Internal Affairs was one of the questions on the Governmental session's agenda. It was stated there that the criminal situation in Tuva is constantly getting worse. The number of crimes committed during the first 7 months of this year is 20 per cents over than that of the last year. The measures undertaken by the Tuvan militia are estimated as insufficient. Interesting is the fact that the work of minister for internal affairs Sergei Mongush became so scrupulously analyzed in the Government right after he made public his decision to run for the Gosduma deputy's position. The Gosduma election in Tuva is to be held on 14, October. The third tennis tournament has opened today in the capital of Tuva. More than 70 sportsmen from 10 Siberian towns take part in it. There will be 4 age categories in this competition. President of Tuva Sherig-ool Oorzhak contributed 100, 000 roubles to this Tournament's prize-fund. Alexandr Kashin, the mayor of Kyzyl, has applied to the Supreme Court of Tuva. He is suing the Central Election Commission for the wrong electorate number mentioned in the CEC resolution on the results of the all-Republican referendum, held on May, 6. As he points out the real number of the Tuvan electorate is 20 thousand more than 157,000 stated in the Constitutional Referendum results. 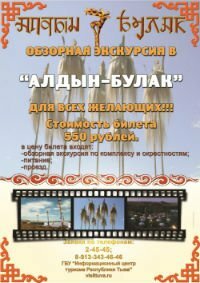 An ORT (an All-Russian channel) crew has come to Tuva. The TV group's interest is teaching of the Russian language in Tuvan schools. Professor of political science of the Ball University (Indiana) Ten-Kuang Chang is observing the political situation in Tuva for his future book devoted to the political systems of small Asian countries. Whom will the Leading Political Party in Russia will Support in the Coming Elections? Sergei Shoigu declared to the journalists that the "Yedinstvo" party will support Sergei Mongush, minister of internal affairs, in the running for the position of the State Duma deputy in th October elections. Ayas Mongush competing with 127 best Tuvan wrestlers has become the Champion in Khuresh in the Naadym tournment for the 10th time. Erzin-horses have proved to be the fastest in Tuva during the Naadym horse-races. 38 official delegations representing subjects of the Russian Federation, federal ministries and 4 frontier aimaks (regions) of Mongolia have come to Kyzyl, capital of the republic in order to congratulate the people of Tuva on its 80th anniversary. Federal minister Sergei Shoigu (born in Tuva) has congratulated his countrymen on the occasion on behalf of the President Putin.